Stainless Damascus Steel for Wedding Band? I hope all things are good with you and your art! I'm wearing my safety glasses and I actually think of your email sign-offs when I slide them on! -Do you have a small piece of 1" diameter stainless bar-stock that I could buy a couple 3/8" cut-offs from? -Failing that, can you recommend a supplier (or another blacksmith) that would have some on hand and willing to sell? -Failing all that, could I commission you to forge a stainless billet (flat bar-stock is probably easiest, I imagine)? I'm of course, open to any suggestions you might have. Nice to hear from you and I am glad you have been doing a bit of work. As you have figured out knife making is a lot of fun with its own set of challenges. I have not done any stainless damascus. It is a challenging weld and draw out. I would take a look at http://www.knifemaking.com/default.asp under blade steels. There is a wide assortment of patterns etc. available. Most are 1/8th inch thick and the pattern is developed on the flat with not much on the edge. You also might want to talk to someone who is producing the stainless Damascus, although I have no recommendations there. Just drilling through would work but you would lose most of the pattern. Also drilling through the stainless and the D2 you will need carbide bits. An alternative is to take a 1/8th thick 3/8th wide strip and bend into the ring size with heat and weld or silver solder together, Then you could get some of the pattern and the 3/8th width. This will show a joint in the finished piece. Alternatively you could bend the strip to the required curvature. Cut 2 to 6 pieces and embed them in a wax base that is the actual ring size. These pieces of Damascus become "gems" embedded in the wax. Then take the wax master with the Damascus in place, to a jeweler that does lost wax casting. They can sprue it up and place it in an investment. Then they will burn out the wax and fill the cavity with molten gold. Once cold you get an exact copy of what you made, so make sure the wax fits your finger before sending it to be cast. Once cast it will still need to be cleaned up and polished etc. The gold should fuse directly to back of the steel at the casting temperatures. In the end this will give you more of a segmented look to the wedding ring with the Damscus pattern showing with a thin line of gold next to it. Bottom Draft Forge Clogs | How to Prevent It? Hi there David hope you and your family are well and hope you busy with your work and lots of sales I have a problem that you may have an answer too , I have 2 forges one side draft which works well the other is a bottom draft and it keeps clogging up with small coke clumps coke dust and molten clinker ,the opening on the forge is 3.5 inches maybe I may need more airflow I'n not sure , it becomes a pain cleaning the forge and restarting it, would you know how to stop this problem hope to hear from you , will send some photos so you can have a look , thank you . This is a universal problem with bottom draft forges. The rate at which it clogs up depends on the quality of coal you can get and the type of work that you do. Eg. heavy forge welding lots more clogging. With coal that has a lot of clinker in it we have to clean perhaps every two hours. Usually not a big problem though. I just scoop the large quantity of coke from the top of the fire, on to the side pan of the forge then scoop out the heart of the fire with the clicker and coals. Toss this into a metal bucket for screening later to get the good bits of coke . Give the clinker breaker a good rattle and make sure all is clear then pile the coals that I originally put aside back into the fire pot and crank the air again. The coals at the side of the forge stay lit for about 1/2 an hour if they are piled up so it is easy to get them back up to temperature with a little air blast. The whole clean out process takes about 3 minutes so it is fast turn around if the coal is bad. Good coal I can get about 4 hours out of before I have to clean out. Another option if you are in the middle of something important is I use a "clinker picker" Just a rod about 30 inches long with a small 1/2 inch diameter hook on one end that I can place down in the fire pot and grab large chunks of clinker that form and hall them out of the air opening and carry on work. Very fast and often all that is required to carry on work for another hour. Since seeing your video on forging a rose some time ago, I have enjoyed making flowers of all kinds and am continually amazed at the accuracy one can achieve with a little heat and a lot of patience. I wanted to seek your advice on a flower I was trying to forge; it has a deceivingly simple shape so I thought I would get some help before going through all of my steel! Because of its bell shape, I wasn't sure if I should raise it, roll it, or some other technique, also, it has that distinct "sweeping" head to it that I can't figure out how to imitate. Any guidance you might have would be very much appreciated. 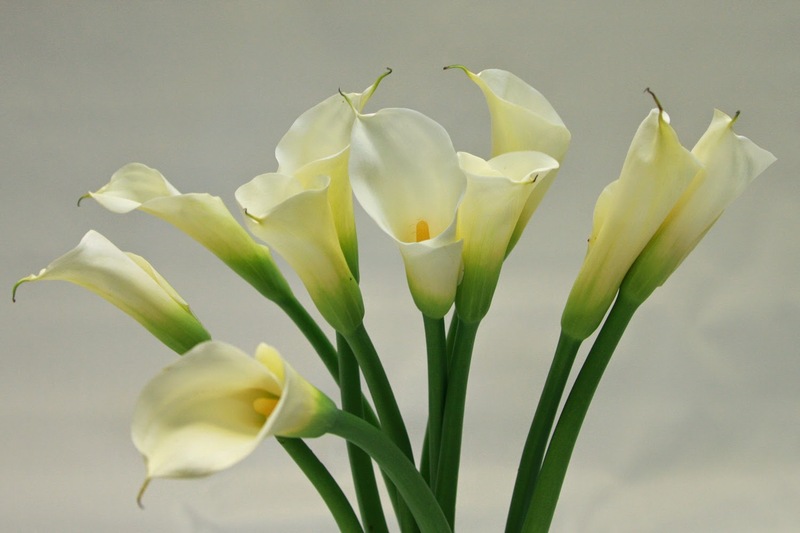 The calla lily is a distinctive flower and you have a couple of options to work with depending on the size that you wish to create. The most common way to make these is to use a thin gage sheet such as 16 to 20 gage. Then cut out the flat pattern and do some texturing on the surface and the edges and then roll into the shape. Electric weld or forge weld onto the stem and the stamens. This technique allows you to create one of any size. Make a card board template first so you can see how it rolls and the final shape that you get. The sweeping head is simply worked hot over the horn until you get the right shape. Gentle hammer strokes. The second way which is suitable for smaller flowers and is more work but allows for some variations, is to use 1.25 inch black pipe or 1.5 inch black pipe. This needs to be cut on a strong diagonal and then "sculpted" to the small point on tip of the flower with a grinder. Then forge the cone or funnel shape of the base which again can be electrically or forge welded to the stem and the stamens. Once the taper is forged or partly forged you may want to add the cut or split down the side to create the over lap for added realism. For more tips and questions answered go to the Blacksmith Forum on the main website. You can also get feedback and ideas from other members as well. What is the Smallest Reasonable Air Hammer / Power Hammer and Suggestions How to Sell Your Work? What is the Smallest Reasonable Air Hammer and Suggestions How to Sell Your Work? Thank you for your time in creating these emails and your web site. The information is very helpful. You talked about power air hammers but can you say something as to the size of the different hammers. The head weight varies and I am not sure what weight is appropriate for my work. I know the heaver the better in general but one has to consider the weight of the machine. That is an issue for me as I move a lot. My real question is how light can you go while still being able to work on larger pieces of stock. Also maybe something on selling. A big obstacle for most all blacksmiths I have come across is how to sell the work and how to price it. You have good suggestions and questions. This is a bit tricky and it sounds like you have done a bit of research. The reason heavier overall and heavier head weight is better is that the over all weight prevents the machine from bouncing around in your shop. This means more energy transmitted to the bar therefore more efficiency. Same idea as a heavier anvil is more efficient. As the head weight increases this is the equivalent of a bigger hammer so you can impart more energy to the bar as well. This design was an H frame much like the KA75 see http://www.ka75.com/ I made some modifications but essentially the same idea. The KA-75 is a single strike hammer. That is every step on the foot peddle produces one strike. A light tap = a light tap on the work, a heavy step = heavy blow on the work. This machine has a great deal of control and best for punch work or single blow tools. I do a lot of continuous draw outs and this tapping the peddle every time I needed a strike drove me crazy so I switched it over to a regular cyclic hammer. There are a couple other issues with the KA. Most important is that you don't have full range of motion on dies since one side is blocked with the H frame. Other than that this little hammer works very well and is reasonably portable. Realistically you can work a 1 inch square bar with a 50 lb hammer. The air hammers I build are 75 lbs and will comfortably work 1.5 inch square. I have worked 2 inch but it was slow going. Sizing is going to depend on how big a piece of steel you expect to work. This is a hard question. I think I have an article up on the website about pricing and what really goes into the cost of making a piece. That is a bit different from the actual selling and that does warrant a full article in itself. Some suggestions. Wholesale trade shows for items that you can sell and make fast and in quantity. Website Online. I would say this is number one marketing strategy in this modern world. If not a full website look at Etsy some people have had very good luck with it. I don't use it myself but I have heard good comments. Consignment at higher end art galleries and art stores. Your own retail location (means you have to stop traveling for a while) also probably means you have to hire someone to run the store as you make the items. Art studio tours. This one depends on location and local studio tour availability. For some people very profitable. That is most of what comes to mind off the top of my head. Each smith has a slightly different path as we each specialize in different products. What Are The Steps In Blacksmithing a 1800's Courting Candle? I wonder if you could assist me in explaining what is the best way to make a courting candle holder like they used in the early 1800's? The one I saw looked like it was made of 5/16 round bar with 8 rings and it had a little loop on the top. Thanks for the courting candle inquiry. I use to make many of these and of several different styles. I used 1/4 round bar or 1/8th by 1/2 inch flat bar. Both look nice. The 5/16 that you mention will work just a bit more effort. Use a 3/4 or 7/8 diameter rod as a mandrel to wrap the steel around. I got fancy as I was making many of these courting candles and built a jig so that I could have a constant spacing on the spiral with a separation of about 5/16. On the smaller stock sizes this could be bent cold. 5/16 diameter rod I would tend to spiral hot. The curved tip was clamped on top of the mandrel and turned as the straight steel was fed in the bottom. There was a catch arm to cause the bending and a spacing pin to keep everything at the right spacing. If done cold there is significant snap back when you make the final loop. With the round bar I forged a handle on bottom end and looped it around to create a base, then up and folded down to make the handle. Another decorative curl on the handle end of the bar. True everything up on a flat surface. For 1/4 inch round bar I used 60 inches of material. Less for the flat bar. The flat bar courting candle I would fold a piece about 3 inches long back under the main candle stem with two holes drilled in it. This was then screwed to a decorative wood base. Alternatively if you want a carry handle you can fold under 12 inches with the 3 inches the same a s above and the remaining 9 inches bent like the round bar up then back down again to form the handle. The plug that spirals up can be made out of wood dowel or pipe with a pin on the side as a handle that fits through the spaces in the spiral structure. Traditionally these plugs were often made out of thin sheet steel as they only have to support the weight of the candle. You will have to do a fair bit of fiddling and fitting to get everything to work properly, but once you have your jigs made up you can make these pretty easily. If you are only making 1 or 2 you will still need the mandrel but you can just eye up the spiral and make any adjustments after it is formed. What is Best Layout For a Blacksmith Shop? I have been a member of your site for a while. I have done welding in the past but never blacksmith work. I have accumulated most items over the years but I am going to join our local blacksmith club in Murfreesboro Tennessee to start learning about the trade. I am also in the process of drawing up plans for a shop/barn combination I wish to start on within the next year. Can you recommend anything on how to layout a shop for blacksmith work? I have seen some people keep the floors dirt and I saw some youtube videos talking about having the forge, anvil and vise in a triangle around where you stand. I just don't want to build the shop and say later that I messed it up. Shop design is a personal thing and each of us have our preferences. Most of us agree that they are never big enough. So that is my first suggestion build it as big as you can afford. I prefer concrete as you can keep it relatively clean and you can move heavy equipment around using wheels and rollers. I don,t like the dirt floors. They kick up too much dust and you can never find a level spot to true up a table. Also if you drop a small nut or bolt it disappears. For standing on I use a piece of plywood by the anvil. This softens the concrete for standing for long periods. The concrete also gives you something to anchor to if you don't want things to move. Again as high as you can afford. I have a small shop with 8.5 foot ceiling and there are many times 10 feet would have been better. Also if you run a gas forge the higher ceilings will allow more of the heat out of the working area of the shop. At least one door should be wide enough to get equipment in and out easily. A roll up garage door is great. I have a 4 foot wide man door that works pretty well. 230 volts and at least 60 amps. 100 amps would be better but depends on the equipment you will be putting in. If using industrial equipment you may want to think about 500 volts and 3 phase. Some debate here. I use standard 4 foot florescent lighting. Some people use spot or task lighting. Generally I suggest well lit as opposed to the "dim blacksmith shop lighting". More the key is uniform lighting especially on and around the anvil. Windows that can open for ventilation. This is personal. A common mistake is that people will put the forge against a wall or in the corner. You should be able to hold and work on an 8 foot bar. Now it is very rare that we ever work 8 feet but the extra space does come in handy. If you work with a coal forge you will need to factor in a chimney. In this case I would put the back of the forge against the wall with the working sides free on either side. You never know when you may have a friend over that wants to do some work too. The triangle is a handy adaption although it is more each major piece of equipment is one point of the geometric form with the anvil in the middle. So forge one point , vise another, layout table another, power hammer another, tool rack another, slack tube another. Again this is personal adaption on your space and work style. If you set something up and hate the work dynamic you can move things around. Cold working tools such as grinders and sanders and welders, should be nearby but do not have to be in the hot working area. It doesn't hurt to sketch a couple of scenarios down on paper and see if they may sense. How Strong Do you Have To Be For Blacksmithing? How Physically Fit Do You Have To Be For Blacksmithing? I noticed that you have a blog where you answer questions about blacksmithing. I am hoping you might answer mine as it is something I think other people wonder about as well. I am thinking of taking a blacksmith class because I appreciate well-made items that are not mass-produced and like the idea of working with metal. I don't intend to make my living this way but hope to make some basic items, like knives, hooks, etc. However, I am curious how strong and in-shape one has to be to do this.? Also, realistically, what kinds of skill sets make a good blacksmith? I am a woman in my 50s, moderately good condition but not an athlete or weightlifter, a bit on the short side. I know how to use basic tools but have never built anything before. Would blacksmithing probably be beyond me? Perhaps you can describe the physical qualities and basic skill sets which make someone a good blacksmith? Hi Tara thanks for your question and I will put it up on the blog as I agree it may be a common question. In this modern age strength is less important than stamina and willingness to look at new ways of doing things. I am by no means what people think of as a hulking blacksmith. I explain to my students that it is really about coaxing the metal to shape not muscling it to shape. This means that there are many repeated hammer blows to create the shape desired. The object is to apply the right amount of force at exactly the right spot to move the metal the right amount. Of course bigger bars require more force to move them. There are a miriad of techniques and tools that help us manipulate the steel. I know a number of women of all ages that do blacksmithing with out any problems. They tend to think more about design and how to work with the steel instead of handling huge bars. Realistically it is a physical activity and it requires standing for long periods of time. There is movement of the hammer. Usually a 2 lb hammer swung many times in a day but you get to take a rest every time the steel heats. This is almost 50% of the time. Most of the starting projects use small bar and this is easy to manipulate. Larger projects often use multiple small pieces that are later assembled. The final project might be quite heavy but we can use over head cranes and hoists to move things around. If you set up a larger shop power hammers can help manipulate the steel. These are expensive machines but the amount of work that they do is incredible. Where I would caution a person with blacksmithing is if they have a previous ailment such as carpal tunnel, tennis elbow, or rotator cuff injuries to their dominant side. The smithing can make these conditions flare up. There are many common skills that serve the blacksmith well and some specialized skills. Understanding that this endeavor requires practice and lots of it. You usually can be successful with minimal effort but to be really good takes a lot of practice. Some ability to roughly sketch on paper what you want to make helps a great deal. Especially with later complicated projects. Not be afraid of the hot metal. Yes you will get burned. Usually they are minor. In short from your description I would say that you would be fine at blacksmithing. Be realistic that it takes time to get good at it but you should have a good degree of success from the beginning. This blog is a companion to www.ArtistBlacksmith.com the main website. The blog is a form of FAQ (frequently asked questions). Instead of emailing people directly I will add questions and answers on the blog. Search around and see if you can find your answer here. Please note all links on this website may lead to Sponsor websites!